The O2 Arena has hosted some of the worlds most popular live events such as Prince, Peter Kay, The Rolling Stones, the BRIT’s, ATP tennis, Led Zeppelin and countless more. The O2 Arena is a host for thousands of visitors from all over the world with the capacity up to 20,000 seats. Clayton Hotel Chiswick is the perfect hotel situated only 1 hour away via A4. The O2 Arena is the second-highest seating capacity of indoor venue. It is not only the world’s busiest music hub for live concerts but a multi-entertainment venue that has been home for some of the biggest names worldwide, such as Justin Timberlake, Beyonce, Adele and Britney Spears, and many more. Diverse sports events have been taking place in the Arena including tennis, gymnastics, wrestling and even the world-famous NBA basketball. 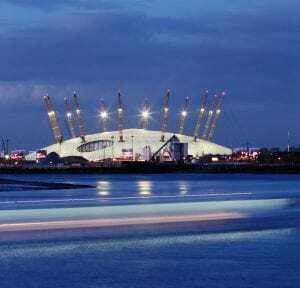 The O2 Arena offers other types of entertainment such as Brooklyn Bowl, Nissan Innovation Station, Up at the O2, restaurants and bars, Cineworld and Sky Studio. Walk 3 minutes to Gunnersbury Station and take the District Line service to Barking. Change at Westminster for the Jubilee Line to West Ham service and get off at North Greenwich Station. Walk 3 minutes to the o2 Arena.